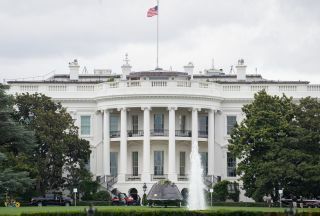 An Orion capsule that NASA flew during an orbital test flight in December 2014 visited the White House July 23, 2018. The longest government shutdown in American history is over, but the damage it inflicted on the nation's space program may be felt for years to come. The 35-day partial shutdown, which caused most of NASA's workforce to be furloughed, ended last Friday (Jan. 25) with a temporary fix — President Donald Trump signing a continuing resolution that funds the government through Feb. 15. For example, the shutdown temporarily halted development work on many NASA missions, as well as outside projects that depend on grant money from NASA and/or other government agencies. This could have serious financial consequences down the road. "Projects that have been put on hold for a month or two — maybe that's sort of incremental, but usually that winds up with that project costing a lot more," Megan Donohue, president of the American Astronomical Society, told Space.com. And some operational missions will also experience significant delays, as the teams involved get everything back up and running again. "The shockwave from the government shutdown will ripple through several months or more even after the shutdown ends, just from a schedule-conflict standpoint," Ken Sembach, director of the Space Telescope Science Institute in Baltimore, which manages science operations for the Hubble Space Telescope, told Space.com. Even more concerning is the prospect of a brain drain. "It is absolutely true that when we have a shutdown, we lose people. And that in fact did happen," NASA Administrator Jim Bridenstine said Tuesday (Jan. 29) during a webcast "town hall" with agency employees. And immediate departures don't tell the whole story. The drama and chaos — the most recent shutdown, which began on Dec. 22, was the third in less than a year — may scare some talented scientists and engineers away from a possible NASA career and toward something more stable, said Casey Dreier, senior space policy adviser at The Planetary Society, a nonprofit organization that advocates for space exploration. "How many people will re-evaluate whether they want to work for NASA in the future? We don't know, but it's greater than zero," Dreier told Space.com. "We're playing with long-term consequences, and we can't understand what they are yet." Such damage may ripple far beyond NASA (which, of course, is a victim of the chaos, not a perpetrator of it), roiling the broader American space industry and science enterprise. For example, some postdoctoral researchers — young scientists just starting out, who often have significant college loans to pay off — may leave science altogether, Donohue said. At particular risk of flight are international postdocs, who have visa issues to worry about as well. "They may take a second guess on whether they want to stay on in the U.S. long-term," she said. "We're talking about very highly educated, creative people." Then there are the involuntary departures. The shutdown cost a significant number of space-sector workers their jobs. Particularly hard-hit were employees of small companies that depend on contracts with NASA and/or other agencies — businesses such as Washington-based Tethers Unlimited, which had to let 20 percent of its workforce go when the government checks stopped coming in. (Larger companies typically have heftier cash reserves and/or other funding streams, and can therefore weather dry spells for longer.) Some of these laid-off workers may well leave the field altogether. Bridenstine vowed that NASA will bounce back strong from the shutdown, but he acknowledged that there will be deleterious effects. For example, it will take NASA a while to get back to normal operations, Bridenstine said, because the agency will have to hire some new employees and find some new contractors: "It is not a one-for-one delay. One day of shutdown does not equal one day of getting back into business." And the shutdown may have complicated NASA's efforts to retain and recruit employees, added Bob Gibbs, NASA's chief human capital officer, who also participated in the Jan. 29 town hall. "We won't really know the true impact for probably some period of time on what it did to the workforce," Gibbs said. "We're in a hypercompetitive market for talent; our people are sought after." Space.com Senior Writer Meghan Bartels (@meghanbartels) contributed to this story. Mike Wall's book about the search for alien life, "Out There" (Grand Central Publishing, 2018; illustrated by Karl Tate) is out now. Follow him on Twitter @michaeldwall. Follow us @Spacedotcom and Facebook. Originally published on Space.com.